And so, after all these retrospectives I come to Shadow in the South. It turns out to be a fitting exit point, because here I don't feel like I'm in Middle-Earth anymore. From me that's significant: it should be clear by now that I'm anything but a Tolkien purist. But there has to be a Tolkien "feel" to everything. For all the dramatic creativity displayed in frontiers like The Northern Waste and The Court of Ardor, and even the Harad modules, that strong Tolkien feel has been there. In Shadow in the South, the resonance collapses. I won't deny I had a blast going through it as a player, and even now I can see why: there are evil temples, vile tombs, and enchanted mazes to keep the boldest PCs occupied for many gaming sessions. But the land is fleshed out so artificially that it feels like Greyhawk -- as if someone thew a bunch of hastily concocted cultures at the map and let them fall where they may. There's also a certain laziness in vision by this point. The peninsula is called The Dominions of the Seven, ruled by lords of Numenorean descent who do their best to keep the shadow of the Storm King at bay. The number "seven" has been obsessed in these southern modules to the point of irritation: Far Harad ruled by a Council of Seven Regents; Greater Harad the Land of the Seven Cities; and now this. It only underscores how ICE is operating outside the geographical canon in a rather cheap way. The territories aren't even clearly defined, the three major cities unremarkable, and the cultural milieus a hodgepodge. Something about these Pel and Drel mannish groups, the Fuina elves, the Mablad dwarves, the Chaialla barbarians... they're all terribly uninspired and I forget the details as soon as I stop reading. The "shadow" over this peninsula, to be sure, serves up plenty of nasty fun. Evil minions operate everywhere, some openly, others from under rocks, most at cross-purposes with each other. 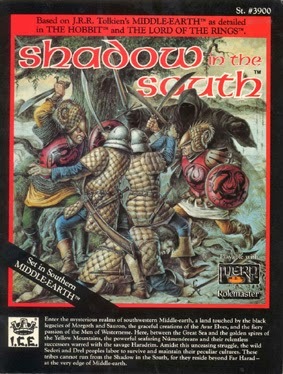 The Army of the Southern Dragon maintains a heavy presence, promising an invasion by the Nazgul Storm King; the Cult of the Dark Overlord, led by four liches, holds the lowest profile and plots (with Ardana from The Court of Ardor) to bring about Endor's destruction; the Priesthood of the Black Hand preaches openly for Sauron, based in a northeastern city which protects dangerous religions on grounds of diversity; the Eyes of Malezar are an army of wights commanded by a vampiric sorcerer; the Slayers a coalition of crude assassins flying fell beasts; and finally (my favorite), the Cult of the Real Fire holds Aluva (Eru) and Malkora (Melkor) in equal reverance, evangelizing every corner of the Dominions with obnoxious dualistic fervor. As a player I was subjected to a lot of this business, and will never forget my ordeal in the House of the Black Hand, where I had to rescue of a woman going under the knife, on an altar below steaming dragon sculptures, and in front of hundreds of brainwashed converts. The tomb of Malezar left scars on my characers too. I did have fun tormenting the Real-Fire prophets and ridiculing the impossible Balance they strive for. All of these minions are given strongholds of impressive design, and if you can forget you're supposed to be in Middle-Earth, you can have a great time with this stuff. So that's it. From Rangers of the North to Shadow in the South. Thirty-seven modules, about half of ICE's output over a 17-year period ('82-'99). It's been a fun ride, and I honestly wasn't sure where I was going. But my nostalgia is vindicated. On whole, these modules hold up supremely well. They gave me endless enjoyment in my formative years, and still do as I reread them and relive wild memories. I can only hope they are still being used by today's generation of gamers. Even if Tolkien would cringe at a lot of ICE's liberties, I'd like to think he'd be pleased by the ambition -- at very least, by the underlying reverence for his work. I've never seen the Shadows in the South, perhaps its just as well. I'm running a LOTR campaign and mining MERP for information, ideas and the occasional inspiration. I hew closer to Tolkien, and the rational studies and papers written and supplying logical extensions of things like, so where are all the Dunedain in the North? How many are there really? Ice material for Eriador provides bones to hang the meat of a campaigh in Eriador, for most of it was never directly more than passingly mentioned. It still works awesomely as a sandbox for me. Thanks for posting this nice series of reviews. Every few years I get the itch to expand my collection of these 'modules', which began when I first found the primitive-looking and at the time very disappointing Umbar around 1983. Only Fenlon's incredible maps kept me buying - they have the amazing ability to make me imagine them as a birds-eye view of real populated and detailed places begging to be explored. The one time I actually used my MERP stuff in my D&D years I just improvised a grand wilderness trek based on Fenlon's maps. I still look to these reviews as a guiding line on where to mine material for Middle-earth gaming. Thanks for your take on these classic modules, all your words are helpful.